It usually doesn't take long after Labor Day for studios to start rolling out some of the better films in their fall lineups. This year, it's just one week, with two films debuting that might be in contention for end-of-year awards. Okay, three if you count the Razzies. Part of Steven Soderbergh's efforts to work in every genre in Hollywood, Contagion is just the second overtly-commercial film in three years for the hyper-prolific director, who has averaged about a film and a half per year for the past decade, in addition to editing, shooting, writing and taking odd jobs like working on the second unit for The Hunger Games. It's exhausting just reading his C.V. In any case, this film gets him back working in the mainstream and with a host of Hollywood stars. From the outside, it doesn't seem like the kind of film that needs a Soderbergh to help it, looking a lot like an update of Outbreak. Matt Damon plays a man thrust into the middle of a SARS-like pandemic when his wife (Gwyneth Paltrow) becomes patient zero for the disease. 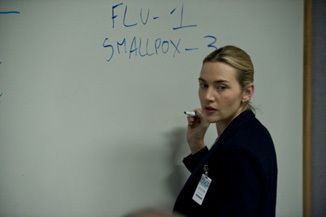 As it spreads around the world, an all-star team of Hollywood doctors, including Jude Law and Kate Winslet attempt to find a cure before it wipes out humanity. The panic about the virus might be worse than disease itself, however. When will we humans ever learn? Though it's typical Hollywood genre fare, one presumes that Soderbergh can elevate it with his usual mastery of technique and style. Not that I expect most audiences to care about that exactly, but it does present a better product to sell.